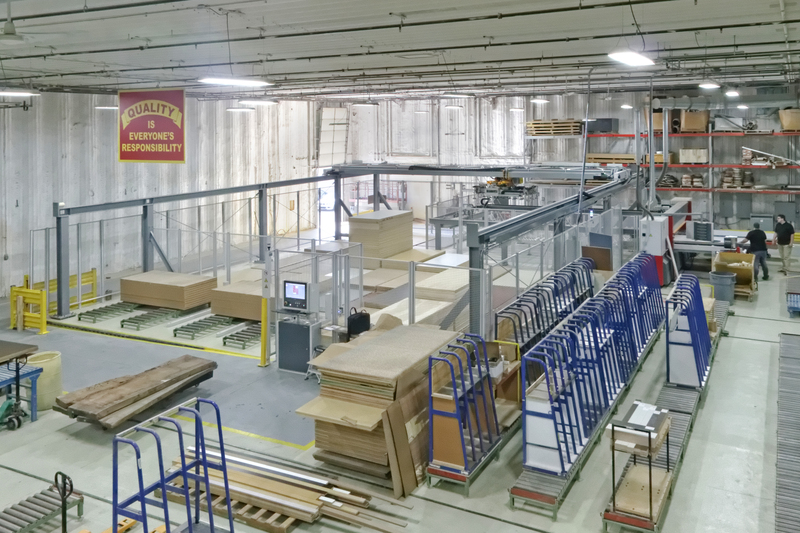 American Millwork and Cabinetry recently added a new Schelling fh4 saw and VS 12 storage and retrieval system. The system enabled the company to streamline its process and allows case-goods to be manufactured in a more efficient manner, president and CEO George Reitz said. The company’s 45 employees make reception desks, nurses stations, semi-custom and custom casework, display cases and panel systems in a 60,000 square foot location in Emmaus, Pennsylvania. AmeriCase was formed to highlight and differentiate the strengths and capabilities of the two operations. American Millwork specializes in high-quality architectural millwork. The AmeriCase line produces a more standard, or semi-custom, product primarily targeted for the institutional, educational, retail and medical/healthcare users. The AmeriCase production area is separate from solid wood production and custom production areas and includes the new Schelling fh4 saw and VS 12 storage and retrieval system, along with kitting carts that move groups of cut pieces from place to place. The saw takes panels from the retrieval system, cuts them, and then they are machined, edgebanded, and go to dowel insertion and the case clamp. The new VS 12 storage and retrieval system for the AmeriCase line is the first system of its kind installed in an architectural millwork and casework plant in the United States. This Schelling fh4 is a rear-loaded panel saw, with the ability to cut plywood or composite sheet goods up to 5 x 12 feet. It will also accomplish a significantly larger throughput than any saw without a retrieval system. According to Reitz, his engineers can program the retrieval system in the evening before the plant shuts down, and it will work through the night retrieving, sorting and stacking the panels for next day’s production. It can store and retrieve materials from up to 4,500 sheets in 24 to 30 stacks of material that are 80 inches high with no dunnage in between. It can also retrieve and sort more than 300 panels in an eight-hour shift, or overnight. The retrieval system is also an ERP system. “We can look at any given time exactly how many sheets of any material are in inventory. The retrieval system will then start locating materials at the rear end of the saw. A rear labeling system will label all parts as a sheet. Reitz said the Schelling saw was chosen over a similar panel saw. Get the latest news, development, products, insights, and ideas from IMA Schelling American Alliance.